Perfect last minute gardening gift! It’s never been quicker or easier to give a unique gardening gift! Select the gift subscription option below that’s best suited to your budget and the recipient’s garden size. Two ways to give: 1) Email It Instantly – You can elect to give your gift instantly via email during checkout, or 2) Print A Card – Print out a GrowJourney gift card and give the gift when you’re ready. When they redeem their gift, your lucky giftee decides when they want to start their subscription, and where they want their seeds sent. It’s that easy! LARGE GARDEN Gift Subscriptions include 5 Certified Organic seed varieties per month. Best for a few raised beds to large sized gardens over 100 square feet. SMALL GARDEN Gift Subscriptions include 3 Certified Organic seed varieties per month. Best for patios, balconies, and gardens less than 100 square feet. If you are buying a gift subscription for someone in Canada, make sure to choose ‘Canada’ as the shipping country at checkout so that you get billed for the additional shipping costs ($7/month). the perfect gardening gift for ANY gardener! You are purchasing a gift subscription that the gift receiver can activate when they’re ready to start growing. During checkout, you can choose to either instantly email a gift card to the recipient OR print out a beautiful paper card and give the gift when you’re ready. Each month, your gift recipient will receive 3 or 5 unique packets (depending on the plan you choose above) of seasonally-selected, certified organic, heirloom gardening seeds guaranteed to grow in their climate zone. Exclusive access to our online educational resources that make organic gardening simple. Support team of organic gardening experts who are available to answer any gardening questions, any time. Which subscription plan should I pick? Our Large Garden Gift Subscriptions include 5 seed varieties per month. Give one of these subscriptions if your gift recipient has a garden OVER 100 Sq. Ft. (a few raised beds) of space all the way up to a fully edible landscape. 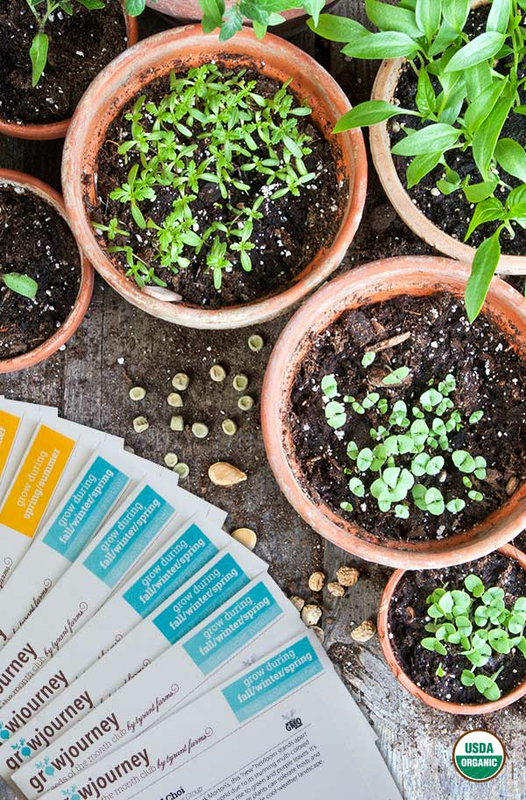 Our Small Garden Gift Subscriptions include 3 seed varieties per month. Give one of these subscriptions if your gift recipient has a garden UNDER 100 Sq. Ft. (a couple of raised beds) of space all the way down to a few pots on a patio. Where can I print a gift card? You can find a gift card here to print out and give to the recipient. Make sure to fill in the space with the gift redemption code and to check the box with the proper subscription (small/large and 3, 6 or 12 month) so that the gift recipient knows which gift option they need to redeem. You are purchasing a gift subscription that the gift recipient can activate when they’re ready to start growing. During checkout, you can choose to either instantly email a gift card to the recipient OR print out a beautiful paper card and give your gift in person. What’s included with my gift? Each month, your gift recipient will receive unique packets of carefully selected, certified organic, heirloom gardening seeds guaranteed to grow in their climate zone. Plus, they’ll get exclusive access to our expert online growing instructions that make organic gardening simple. I was given a gift card. How do I redeem or activate it? If you received a gift subscription and you would like to activate it and start receiving your seeds, please click here. “This has been a most cherished gift! In a world that has become more and more narrow in its options for a variety of quality heirloom seeds, GrowJourney’s seeds are always finding something new and wonderful to tease my palate and fill my plate with. My daughter is always looking for a long-term holiday gift that keeps giving for me. She really hit the jackpot with the GrowJourney Seeds of the Month Club. Even though we live in a very urban area outside of DC and have small space for gardening, I look with excitement every month to see what fresh surprises I will get to explore in the coming months.